بدرزاده, یاسمن, قربانی, احمد, انصاری, عبدالحمید, فاتحی مرجی, محمد. (773). بررسی تغییرات مقاومت ویژه الکتریکی خاک‌ها در حین آزمایش تحکیم. مجله ژئوفیزیک ایران, 5(3), 102-110. یاسمن بدرزاده; احمد قربانی; عبدالحمید انصاری; محمد فاتحی مرجی. "بررسی تغییرات مقاومت ویژه الکتریکی خاک‌ها در حین آزمایش تحکیم". مجله ژئوفیزیک ایران, 5, 3, 773, 102-110. بدرزاده, یاسمن, قربانی, احمد, انصاری, عبدالحمید, فاتحی مرجی, محمد. (773). 'بررسی تغییرات مقاومت ویژه الکتریکی خاک‌ها در حین آزمایش تحکیم', مجله ژئوفیزیک ایران, 5(3), pp. 102-110. بدرزاده, یاسمن, قربانی, احمد, انصاری, عبدالحمید, فاتحی مرجی, محمد. بررسی تغییرات مقاومت ویژه الکتریکی خاک‌ها در حین آزمایش تحکیم. 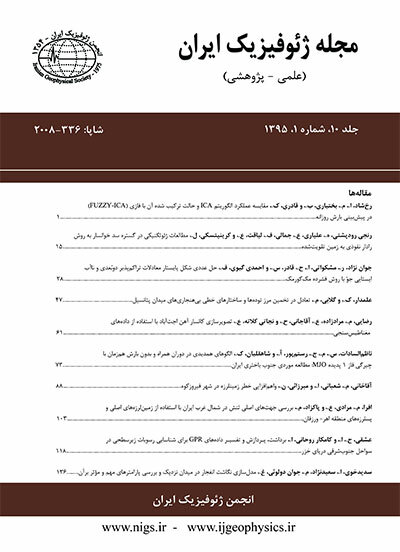 مجله ژئوفیزیک ایران, 773; 5(3): 102-110. ساختار خاک مشخص‌‌کننده خواص فیزیکی آن، به‌ویژه خواص مکانیکی و هیدرودینامیکی، است. روش‌های کلاسیک تعیین خواص ساختاری خاک معمولا نقطه‌‌ای هستند و کمتر برای بررسی تغییرات مکانی و زمانی ساختار خاک سازگار شده‌‌اند. تحقیق حاضر روی استفاده از روش غیر تخریبی مقاومت ویژه الکتریکی برای تعیین خواص ساختاری خاک‌ها صورت گرفته است. نشست ناشی از تحکیم لایه‌‌های رُسی، به علت ماهیت تدریجی و طولانی آن، می‌‌تواند خطر بزرگی برای سازه‌‌های بنا شده روی این خاک‌ها محسوب شود. علت این نشست تغییرشکل فشاری و جا‌به‌‌جایی ذرات خاک، رانده شدن هوا و آب از حفره‌های خاک و عوامل دیگر است. از طرفی جابه‌‌جایی ذرات خاک و آب‌‌و‌هوا می‌‌تواند روی مقاومت ویژه الکتریکی خاک نیز تاثیر گذار باشد. در این تحقیق چهار نمونه خاک دست خورده در درون دستگاه ائودومتر استاندارد آزمایش تحکیم، سازگار شد و مورد اندازه گیری هم‌زمان مقاومت ویژه الکتریکی قرار گرفت. در حین ثبت نشست خاک، تغییرات مقاومت ویژه نیز ثبت شد. همه آزمایش‌های تحکیم و مقاومت ویژه الکتریکی، در حالت اشباع کامل خاک صورت پذیرفته است. نتایج حاصل نشان می‌‌دهد که مقاومت ویژه الکتریکی به حالت فیزیکی خاک وابسته است (ثبت مقادیر مقاومت ویژه کم به‌دلیل وجود نمک در خاک و تغییرات 50 درصدی مقاومت ویژه الکتریکی در طول آزمایش‌ها است). به‌طورکلی در طول زمان تحکیم، مقاومت ویژه الکتریکی افزایش می‌‌یابد. منحنی‌‌های لگاریتمی کامل تخلخل- مقاومت ویژه الکتریکی وجود دو خط با شیب‌های متفاوت را نشان می‌‌دهد. شیب خط مربوط به مرحله ابتدای فرایند تحکیم، کمتر است. به‌طورکلی شباهت رفتاری مقاومت ویژه و تحکیم خاک، توانایی روش مقاومت ویژه الکتریکی برای بررسی‌‌های طولانی مدت و بر جای تحکیم خاک را نشان می‌‌دهد. Determination of the quality and amount of soil settlement due to compression of the underground soil strata are the most important stages in the establishment of stable structures. Soil compressive settlement is induced gradually as a function of time and can be considered as a source of substantial hazards. When a saturated soil stratum is affected by augmented stress, pore water pressure increases significantly. In sandy soil with high permeability, drainage due to pore water pressure is completed rapidly. Pore water drainage occurs as a consequence of a reduction in the soil volume, resulting a settlement termed consolidation settlement. Additionally, in sandy soil, because of rapid drainage of the pore water, instantaneous and consolidation settlements occur simultaneously. In contrast, when a saturated clayey soil is affected by augmented stress, instantaneous settlement occurs in a preliminary process. Due to the low permeability coefficient of clayey soils with respect to sandy ones, the water drainage in clayey soil progresses gradually and over a relatively longer time period in which consolidation settlement follows instantaneous settlement. In order to investigate consolidation settlement and its degree and speed, knowledge of the existence of the clayey strata, their thicknesses, porosity and compressive indices are necessary. Such information is usually obtained from drilled boreholes and samples taken from them. In this regard, borehole drilling is time and cost-consuming, and the very processes involved in the preparation of the samples restricts the efficiency of such geotechnical methods. Soil structure is determined mainly by its physical properties (especially hydrodynamic and mechanical properties). Conventional methods for determining soil structures are usually spatial and they rarely incorporate changes in location and time. This study uses the non-destructive method of the electrical resistivity measurement to examine the soil structure. The main reasons for this settlement are compressive displacements, dislocations of the soil particles, and the gradual expulsion of air and water through the voids of the soil. On the other hand, the displacements of the soil particles and the expulsions of air and water affect the electrical resistivity of the soils. In this research, four soil samples (in disturbed and homogenized form) are tested in a standard ASTM Odometer which was specially designed and improved for simultaneous measurement of the soil electrical resistivity during the consolidation test. During the recording of soil settlement, the simultaneous changes in the electrical resistivity of the soil were also recorded. All tests were conducted on saturated soils. The measured results show that electrical resistivity is related to the physical state of the soil. Low electrical resistivity of soil samples is due to salt traces in the soil which may cause variations of up to 50 percent in the value of the resistivity during the consolidation test. Generally, during the consolidation period the electrical resistivity increases. The full logarithmic curves of porosity-resistivity show two distinct lines with different slopes in which the slope of the line related to the beginning of the consolidation process is lower. The similarity between the consolidation behavior and electrical resistivity of soil shows the potential of the electrical resistivity method for the possible study of the in situ and long-term consolidation of soils.